The BallWeb is an innovative device which fits over a Swiss ball (55cm - 75cm) to enable the more effective and versatile use of resistor cords, providing a fun andchallenging workout for all. TheBallWeb is ideal for all ages and fitness levels. 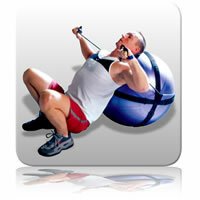 No matter what your exercise goals, the BallWeb can help with toning, strengthening and core stability. This is a God-send for the mobile fitness trainer. Challenging the beginner right through to the elite athlete.